The journal focuses in the reception of the European 18th century ideas in the Greek space and generally in South-East Europe. Further, it focuses in the origins and the survivals of the Neohellenic Enlightenment, and thus also publishes studies concerned with the period before and after the 18th century. The International Congress on the Enlightenment is the quadrennial meeting of the International Society for Eighteenth-Century Studies (ISECS) and the world’s largest meeting of specialists on all aspects of the eighteenth century. All the back issues of Ho Eranistes/The Gleaner now available in open access! The Greek Society for Eighteenth-Century Studies (OMED) is pleased to announce that the volumes 1 (1963)-28 (2011) of the journal are now available in open access. OMED invites those who are interested in the contents of the journal to register for free (menu>Register), in order to receive emails with the Contents of the new volumes and information on the activities of the Society. The Gleaner is also available in print. If you wish to obtain information on prices, available volumes etc. you are invited to contact us by email (About the journal>People>Principal contact). The Greek Society for Eighteenth-Century Studies (OMED) welcomes you to its site and invites you to visit the online edition of its academic journal, Ho Eranistes/The Gleaner. The electronic publication of the journal is carried out in collaboration with the National Documentation Centre (EKT). Ever since the publication of the first issue in February 1963, only a few months after the establishment of OMED, the journal has been published up to our days. The Gleaner mainly publishes articles written by members of OMED, but also welcomes original contributions by other scholars on the subject of the Neohellenic Enlightenment, and more generally on the history of culture and ideas in the 18th century South-East Europe. OMED and EKT digitized and made available all the back issues of the Gleaner, 1 (1963)-28 (2011), online. 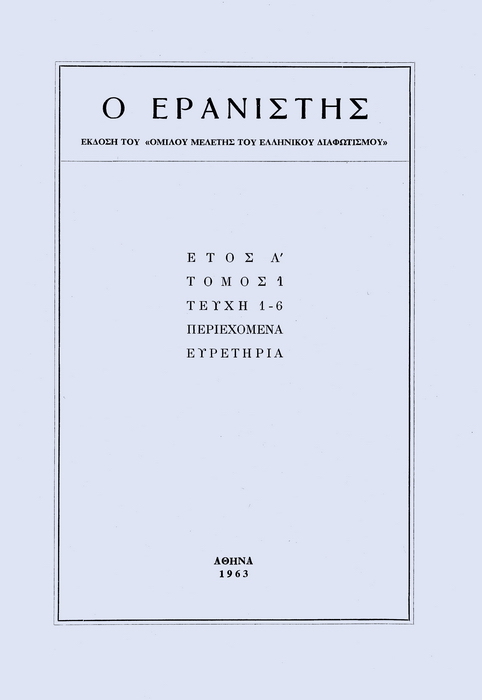 OMED is in the process of digitizing and offering to scholars and the public all of its publications, and specifically: the series “Neohellenic Texts”, namely the six volumes of Koraes’ correspondence, the “Ephemerides” (the personal diary of Panagiotis Kodrikas), the correspondence of Daniel Philippides with Barbié du Bocage and Anthimos Gazis, the “Philotheou Parerga” (Les loisirs de Philothée) of Nicolas Mavrocordatos, as well as future publications, such as the “Epistolarion” of Eugenios Voulgaris. OMED will also make available the Proceedings of the Congress Neohelliniki Paideia kai Koinonia (“Neohellenic Culture and Society”), held in 1993 so as to honour the memory of its founder, C. Th. Dimaras.